Pancreatic cancer (PC) is a highly lethal cancer. Despite a significant advancement in cancer treatment, the mortality rate of PC is nearly identical to the incidence rates. Early detection of tumor or its precursor lesions with dysplasia may be the most effective approach to improve survival. Screening strategies should include identification of the population at high risk of developing PC, and an intense application of screening tools with adequate sensitivity to detect PC at an early curable stage. Endoscopic ultrasound (EUS) and magnetic resonance imaging (MRI) seem to be the most promising modalities for PC screening based on the data so far. EUS had an additional advantage over MRI by being able to obtain tissue sample during the same examination. Several questions remain unanswered at this time regarding the age to begin screening, frequency of screening, management of asymptomatic pancreatic lesions detected on screening, timing of resection, and extent of surgery and impact of screening on survival. Novel techniques such as needle-based confocal laser endomicroscopy (nCLE), along with biomarkers, may be helpful to identify pancreatic lesions with more aggressive malignant potential. Further studies will hopefully lead to the development of strategies combining EUS with other technological/biological advancements that will be cost-effective and have an impact on survival. Endoscopic ultrasound-guided fine needle aspiration (EUS-FNA) has become a fundamental tool in obtaining cytopathological diagnosis of pancreatic tumors. When sampling solid lesions of the pancreas, the endosonographer can use two suction techniques to enhance tissue acquisition; the dry and the wet suction techniques. The standard dry suction technique relies on applying negative pressure suction on the proximal end of the needle after the stylet is removed with a pre-vacuum syringe. The wet suction technique relies on pre-flushing the needle with saline to replace the column of air with fluid followed by aspiration the proximal end by using a prefilled syringe with saline. A new modified wet suction technique (hybrid suction technique) relies on preloading the needle with saline, but having continuous negative pressure with a pre-vacuum syringe to avoid manual intermittent suction. 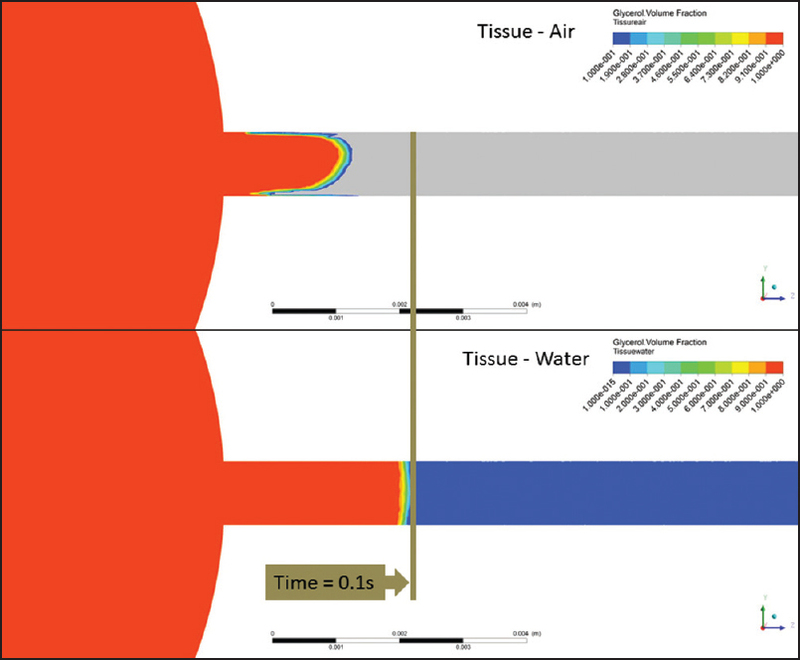 Tissue acquisition can be enhanced by applying fluid dynamic principles to the current aspiration techniques, such as the column of water used in the needle of the wet technique. In this review, we will focus on EUS-FNA using the wet suction technique for sampling of pancreatic solid lesions. Pancreas divisum (PD) is the most common developmental anatomic variant of pancreatic duct. 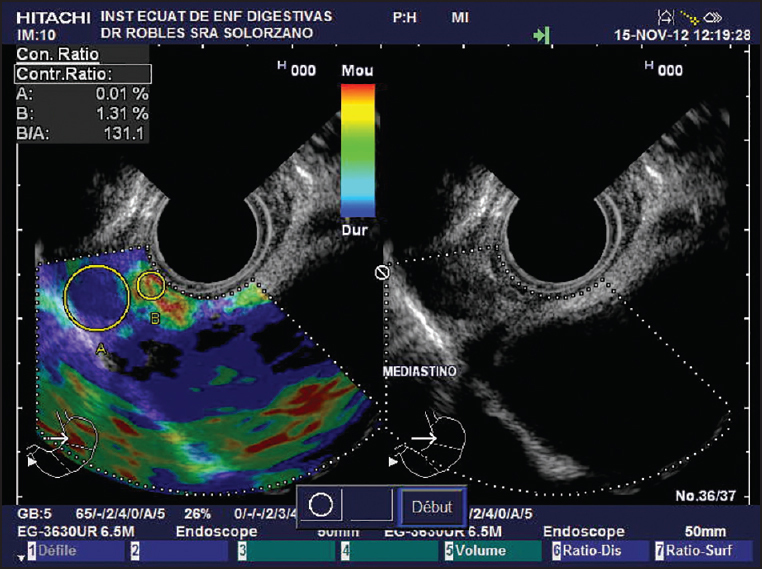 Endoscopic ultrasound (EUS) is often performed to evaluate idiopathic pancreatitis and has been shown to have high accuracy in diagnosis of PD. The different techniques to identify PD by linear EUS have been described differently by different authors. 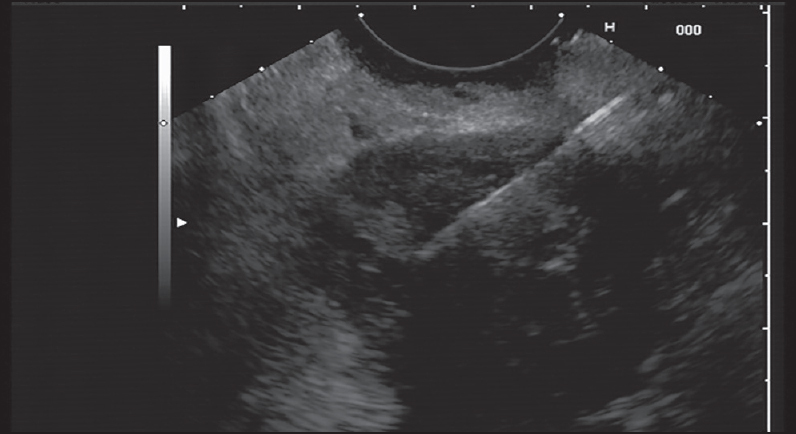 If EUS is done with a proper technique it can be a valuable tool in the diagnosis of PD. The anatomical and technical background of different signs has not been described so far. This article summarizes the different techniques of imaging of pancreatic duct in a suspected case of PD and gives a technical explanation of various signs. 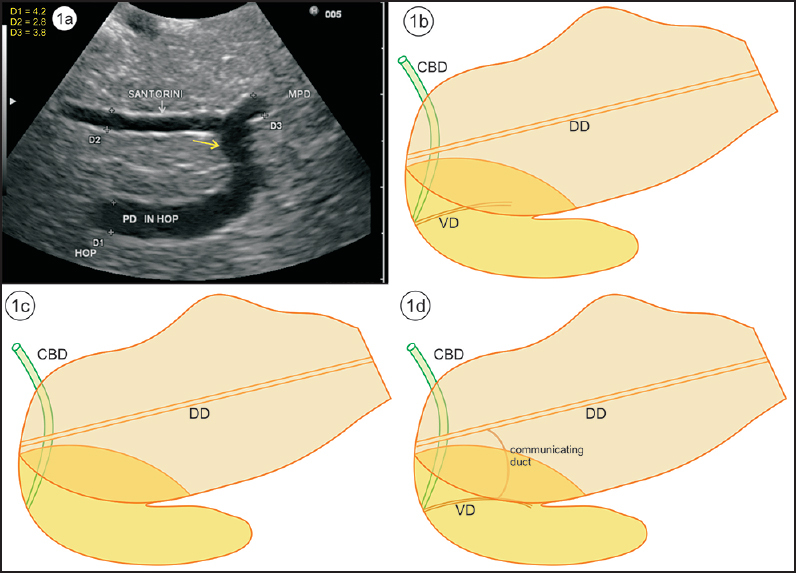 The common signs seen during evaluation of pancreatic duct in PD are stack sign of linear EUS, crossed duct sign on linear EUS, the dominant duct and ventral dorsal duct (VD) transition. Few other signs are described which include duct above duct, short ventral duct /absent ventral duct, separate opening of ducts with no communication, separate opening of ducts with filamentous communication, stacking of duct of Santorini and indirect signs like santorinecele. The principles of the sign have been explained on an anatomical basis and the techniques and the principles described in the review will be helpful in technical evaluation of PD during EUS. Background and Objectives: Diagnosis of pancreatic lesions remains a clinical challenge. This study aimed to evaluate the diagnostic accuracy of endoscopic ultrasound-guided fine-needle aspiration (EUS-FNA) in pancreatic mass lesions. Patients and Methods: Clinical data, laboratory tests, and cytopathological and imaging reports were collected from 185 pancreatic EUS cases performed from March 2010 to January 2014. The final diagnosis was based on surgical findings, EUS-FNA or computed tomography (CT)-guided biopsy. Results: A total of 100 pancreatic FNAs were obtained by EUS. Most positive diagnoses of malignancy were pancreatic adenocarcinomas (n = 61). The site of pancreatic adenocarcinoma was the head in 50 (82.0%), body in seven (11.5%), and tail in four (6.5%). The sensitivity, specifi city, and positive and negative predictive values of EUS-FNA for diagnosing adenocarcinoma were 80.3%, 92.3%, 94.2%, and 75.0%, respectively. Discussion: We concluded that EUS-FNA of pancreatic lesion accurately diagnoses pancreatic adenocarcinoma and should be considered for the standard management of pancreatic adenocarcinoma. 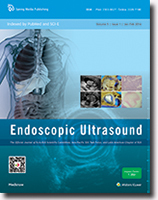 Background and Objective: Navigation of a flexible endoscopic ultrasound (EUS) probe inside the gastrointestinal (GI) tract is problematic due to the small window size and complex anatomy. 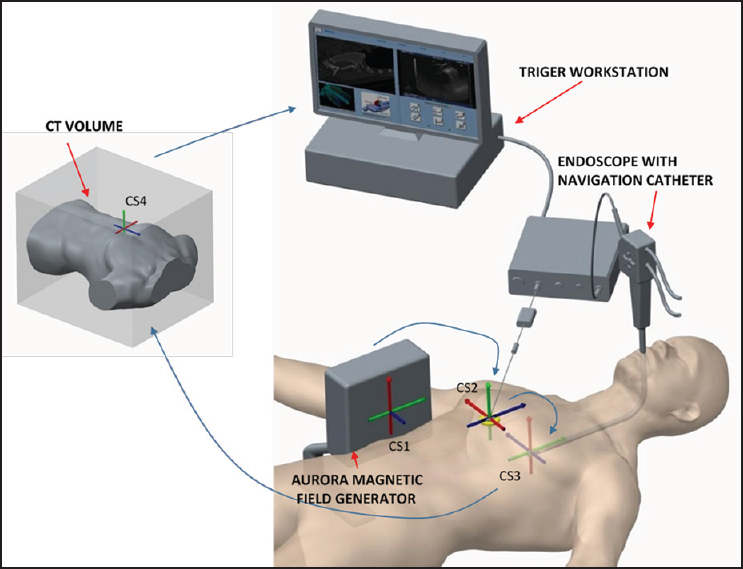 The goal of the present study was to test the feasibility of a novel fusion imaging (FI) system which uses electromagnetic (EM) sensors to co-register the live EUS images with the pre-procedure computed tomography (CT) data with a novel navigation algorithm and catheter. Methods: An experienced gastroenterologist and a novice EUS operator tested the FI system on a GI tract bench top model. Also, the experienced gastroenterologist performed a case series of 20 patients during routine EUS examinations. Results: On the bench top model, the experienced and novice doctors reached the targets in 67 ΁ 18 s and 150 ΁ 24 s with a registration error of 6 ΁ 3 mm and 11 ΁ 4 mm, respectively. In the case series, the total procedure time was 24.6 ΁ 6.6 min, while the time to reach the clinical target was 8.7 ΁ 4.2 min. Conclusions: The FI system is feasible for clinical use, and can reduce the learning curve for EUS procedures and improve navigation and targeting in difficult anatomic locations. Background and Objectives: Endobronchial ultrasound-guided transbronchial needle aspiration (EBUS-TBNA) is a minimally invasive procedure that has a well-established role in the diagnosis and staging of lung cancer. This technology is also widely used for the diagnosis of mediastinal masses and cysts as well as other inflammatory disorders such as sarcoidosis. However, the utility of this procedure in the diagnosis and subclassification of lymphoproliferative disorders (LPDs) is not clear. We performed a systematic review to evaluate EBUS-TBNA use in LPDs. Materials and Methods: PubMed, EMBASE, MEDLINE, Cochrane Library Plus, and ISI Web of Knowledge were searched for studies of clinical trials in English reporting diagnostic performance of EBUS-TBNA in lymphoma until September 2014. The overall sensitivity, negative predictive value (NPV), and diagnostic accuracy were evaluated. Results: Six trials involving 346 patients with suspected lymphoma were included. The overall sensitivity, NPV, and diagnostic accuracy ranged 38%-91%, 83%-96.4%, and 91%-97%, respectively. Further invasive surgery was needed only in 13-43% of the patients. None of the studies included in the present review reported important complications. Conclusion: Current evidence suggests that EBUS-TBNA can be used as an initial evaluation for patients with suspected lymphoma. Additional surgical procedures may be necessary if a sample is inadequate or negative with high suspicion of lymphoma. Further multicenter trials are needed to evaluate the diagnostic yield of EBUS-TBNA in lymphoma patients. Background: Nonfunctional pancreatic neuroendocrine tumors (NF-pNETs) are increasingly being diagnosed but management, especially of small tumors, remains a clinical dilemma. Endoscopic ultrasound guided fine-needle aspiration (EUS-FNA) is now routinely used for diagnosis of pancreatic neuroendocrine tumors (pNETs) but has not been well studied as a tool for identifying aggressive disease. Materials and Methods: A systematic search of the cytology database identified all patients at our center who underwent EUS-FNA from 1999 through 2011 and were diagnosed with NF-pNET. Results: A total of 50 patients were identified. 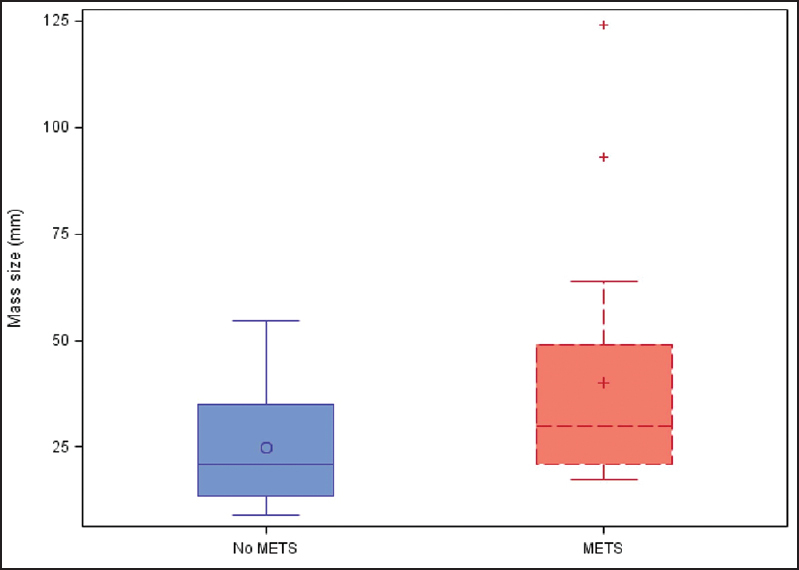 Though patients with metastatic disease had a mean tumor size of 40 mm compared to 25 mm in patients without metastatic disease (P = 0.04), we also identified several patients with tumors <20 mm who presented with metastatic disease. Furthermore, we found no statistically significant difference in metastatic disease between tumors <20 mm and >20 mm (P = 0.13). Using receiver operating characteristic (ROC) analysis, we found that using a cutoff point of 20 mm only led to a sensitivity of 85% in screening for metastases, while lowering the cutoff point to 18 mm allowed for a sensitivity of 95%. Conclusion: Currently, guidelines suggest that only patients with tumors greater than 20 mm undergo surgical resection, as tumors less than this size are thought to have low risk of metastases. Our analysis suggests that these recommendations could lead to undertreating patients with small tumors. Tumor size alone may be inadequate as a marker for aggressive NF-pNETs. Given this, other risk factors for aggressive pNETs should be studied to help identify the patients most likely to benefit from surgery. During endoscopic ultrasound-guided fine-needle aspiration (EUS-FNA) of a pancreatic malignancy, a small quantity of free fluid, not seen before, suddenly appeared in the view, and time was spent ruling out ongoing hemorrhage. However, during follow-up, the patient gradually developed peritoneal signs and was referred for surgery. The images presented elucidate the diagnosis and raise the question of a theoretical change in diagnostic and therapeutic approach. Pulmonary aspergillosis generally occurs in patients with prolonged neutropenia or immunosupression. Definitive diagnosis depends on the demonstration of the organism in tissue, as positive culture result from sputum, needle biopsy, or bronchoalveolar lavage fluid. Even though endoscopic ultrasound (EUS) fine needle aspiration (FNA) of paraesophageal/mediastinal lesions has been used numerous times, this is the first case that reports an aspergilloma diagnosed by EUS-FNA, allowing us to reach a definitive diagnosis. We present a patient with a nodular lesion located in the right upper lobe lung, with ground-glass opacity. 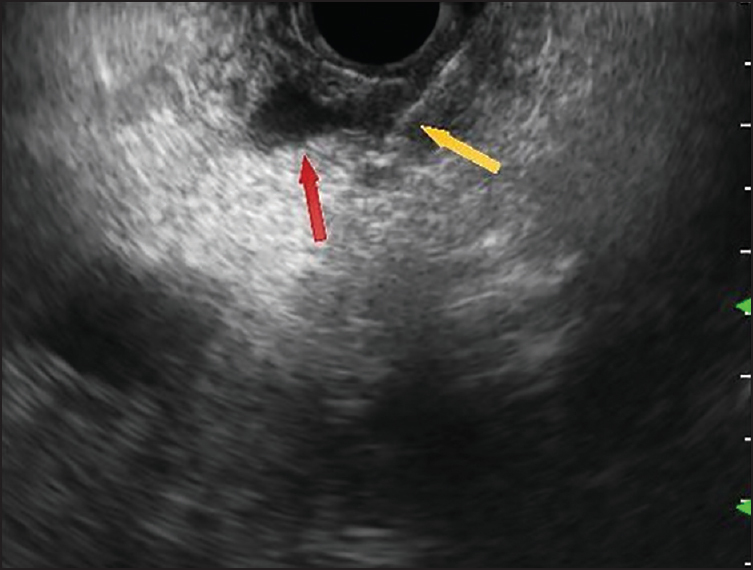 Upper EUS revealed an ill-defined hypoechoic paraesophageal lesion with a central annular image. Culture results from EUS-FNA were positive for Aspergillus fumigatus. There are no previous reports of EUS imaging features of pulmonary aspergillosis. We believe that this central annular image in an ill-defined hypoechoic paraesophageal lesion may be a characteristic feature.